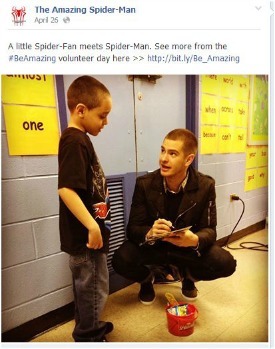 The "Be Amazing" campaign has the cast of "The Amazing Spider-Man 2" traveling to promote the movie and do good works. The latest installment in The Amazing Spider-Man franchise is opening in the US in a few days. So of course the cast has been traveling around the world promoting the summer blockbuster, appearing on TV talk shows and red carpets across the globe. In addition to the traditional movie promo stuff, there’s the “Be Amazing” campaign where the cast — Andrew Garfield, Emma Stone and Jamie Foxx — travel to various locations doing volunteer work and taking snapshots with young fans. The film’s “Be Amazing” Pinterest board is filled with photos of the cast hanging out with kids, drawing murals and generally having a good time. Then you get this sort of publicity — a world famous actor photographed with children who love the superhero character he plays, getting a chance to dress in a cute costume and live out a little fantasy. It all makes you wonder why more of the summer popcorn movies haven’t tried to add a philanthropic component to the premiere world tour. Or maybe they have and we just haven’t heard too much about it? If it’s the latter that’s both a shame and a missed opportunity. Good works should be done for the sake of doing good works. At the same time, in this case they provide an exciting way for fans to connect with the celebrities, brands and films they support with millions of dollars every year to do something positive at the same time. And seriously, Emma Stone’s 1,000-watt smile shows that she’s not so put out by taking a break from the international glamour stuff that we’ve all grown used to seeing to do something a little different. With these summer movies, many of which are based on comic book characters, there’s a built-in chance to engage fans who love to go bananas while indulging in their favorite characters. Spider-Man in particular is so iconic and appeals to so many young children (as evidenced by all the Spidey costumes that Garfield is posing with), it’s just a nice way to say, “Come see Spider-Man 2 when it opens up this Friday.” It also further fosters that fandom. The “Be Amazing” campaign partnered with Grow NYC for this event. One critique we have is the lack of information about the program on the movie’s official site. We took a look and couldn’t find any other details about where it’s going next or what’s doing. Talking up those charitable acts might inspire other movies to do the same.